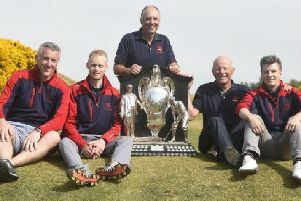 Lothians man David Inglis is set to create a bit of history in the Arnold Palmer Cup, the college equivalent of the Ryder Cup. The former British Boys champion has been picked as Team Europe’s coach for the event’s 20th anniversary in Atlanta in June. The appointment sees Inglis, who hails from Roslin and cut his golfing teeth at Glencorse, become the first Palmer Cup player to be a head coach for the match. “It is a tremendous honor to be chosen to coach the European team at this year’s Arnold Palmer Cup,” said Inglis. “I was fortunate to be part of the first-ever European team in 2003 and now to be coaching the European team is a dream come true. Inglis’ connection with the event actually goes back to 2001, when he represented Great Britain & Ireland during a spell at the University of Tulsa. In the 2003 Walker Cup at Ganton, he beat Ryan Moore, the man who clinched victory for the US in last year’s Ryder Cup at Hazeltine, in the second-day singles. Inglis joined Northwestern as its assistant coach prior to the 2010-11 season and was elevated to head coach in 2014. Last year, he guided the “Wildcats” to the Stillwater NCAA Regional and a win at the Marquette Invitational. “I can’t wait to put the team together over the next few months,” he added. “This event has been a big part of my golfing career as a player and now a coach. Robertson assisted fellow Scot Janice Moodie as Europe won last year’s event at Formby in Lancashire. Andrew Coltart was also a winning captain at Walton Heath in 2014, when the European team included both Grant Forrest and James Ross. Inglis was the one-time golden boy in Lothians golf, winning the British Boys’ Championship at Hillside in 2000. During his college spell, he was a four-time champion of the Western Athletic Conference and three-time Ping All-American. He also earned Cleveland Golf All-America Scholar honors in 2003-04. The Arnold Palmer Cup takes place at Atlanta Athletic Club on June 9-11.